Automatically export MySQL database to specified sql file. Automatic Backup Scheduler for MySQL > Tutorials > Automatically export MySQL database to sql file. Automatic Backup Scheduler for MySQL can help you automatically export remote or local MySQL databases to the specified files ( use the MACRO variables to create a new file every time or overwrote the previous file ). You can easily select any MySQL database items to export, and choose to export all of the selected databases to a single file each time or export different databases to different files. The software will automatically delete the expired or the oldest exported files according to your settings. Click here to learn more about how to install the software. 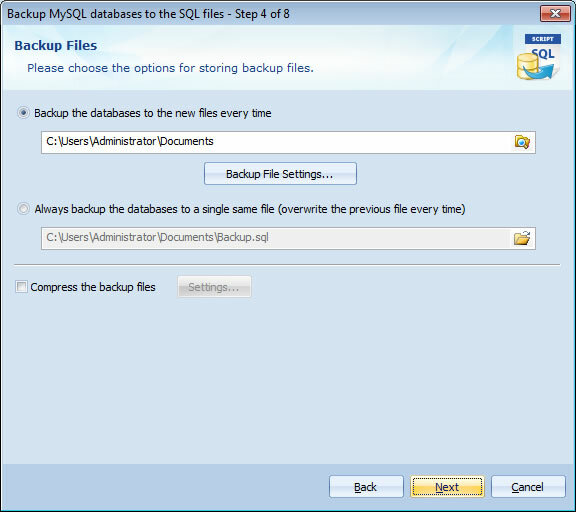 Steps of creating a task to Back up MySQL databases to the SQL files. 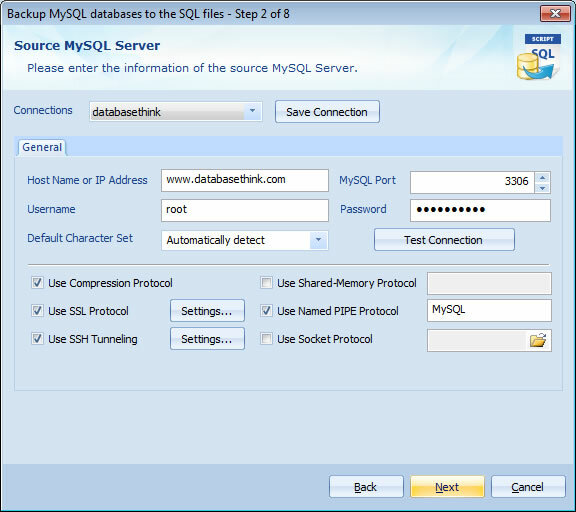 Step 3: Connect the source MySQL server. Please enter the information of the source MySQL server on Step 2 of the Task Wizard and click Next to select the databases which you want to export. Host Name or IP Address: The host name ( e.g. www.databasethink.com ) or IP address ( e.g. 127.0.0.1 ) of the source MySQL server. MySQL Port : The port of the source MySQL server, the default port is 3306. Username: The name of the user on the source MySQL server. Password: The user's password on the source MySQL server. Leave it blank if the user has no password. Click here to read more about how to connect to a MySQL server. Step 4: Select the databases and MySQL items. Please select the databases and MySQL items which you want to export on Step 3 of the Task Wizard and click Next to choose the options for storing the exported sql files. The software can automatically export all of updates of the selected database, it can make incremental / differential export. You can quickly choose to export Tablespaces, Table Structure or Table Records, you can set up the Advanced Settings ( Innodb, Master and Slave, flush, lock, using hexadecimal notation, etc. ) to optimize the export. Step 5: Choose the options for storing the exported sql files. Please choose the options for storing the exported sql files on Step 4 of the Task Wizard and click Next to choose the options for uploading the backup files. Export MySQL databases to the new file every time. 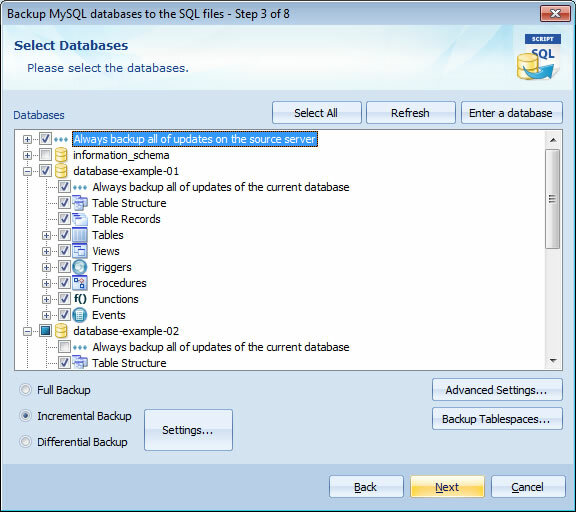 If you choose the option Back up databases to the new files every time, the software will export the selected databases to the specified folder and create new files every time. You can click Backup File Settings... to set up the options. How Many Files: You can export all of the selected databases to a single file each time or export different databases to different files. Backup Files: You can enter a name or use the MACRO variables to create a new sql file every time. Automation Deletion: The software can automatically delete the expired exported files after some days or delete the oldest backup files every some full backup copies. Click here to learn more about the Backup Files Settings. Export MySQL databases to a single same file. 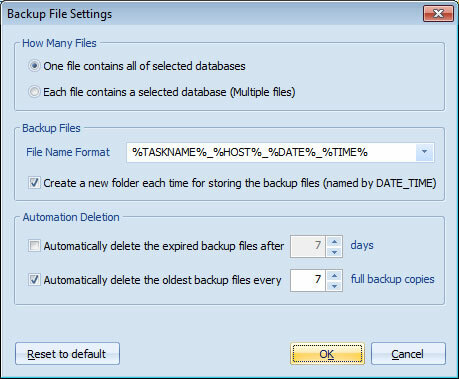 If you choose the option Always back up databases to a single same file, the software will export the selected databases to a single same file every time and the previous file will be overwrote when the task is running. Compress the exported files to GZ / ZIP with password. If you want to reducing the disk usage, please choose the option Compress the backup files and click Settings to set up the compress options. If you want to encrypt the exported sql file, you can compress it to ZIP with password. Choose the options for uploading the exported files ( to FTP server or to Email box ) on Step 5 of Task Wizard. Choose the Task Scheduler for running the task on Step 7 of Task Wizard. That's all. The software will automatically export the MySQL databases to the sql file.